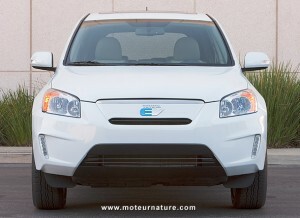 It has been known for a while that Toyota will buy complete electric power trains from Tesla Motors for its upcoming RAV4 EV. Tesla said it will build motors and assemble battery packs at its facilities in California. Toyota now says that it will build the cars at its Woodstock, Ontario factory, alongside the gasoline-powered RAV4. It’s only logic. There’s no better place to build an electric RAV4 than at the RAV4 factory. Reason also commands for the electric RAV4 to be as close as possible to the standard gasoline RAV4. So something has to change from the car pictured on this page. Because I’m expecting a new generation of the RAV4 very soon. I even got surprised to learn that a new Camry will be unveiled on the 23rd of this month. I was expecting the new RAV4 to come first. The actual Camry was unveiled at the Detroit motor show in January 2006, whereas the RAV4 dates from the Frankfurt motor show in September 2005. The Camry makes more sales so it gets shorter product cycles, but nobody expects a Toyota model to last much more than 6 years. Another subject of speculation is a possible hybrid version of the RAV4. Actually, before Toyota teamed up with Tesla Motors, there was a rumor that it had been green-lighted. Had it been canceled because of the Prius v? I hope not, because it would give Toyota a qualitative advantage over all its competitors. The Japanese giant would be the only one to build a car with a choice of gasoline, diesel, hybrid or full electric drive train.